We've just published our Deck Power Rankings for this weekend's Dallas Regionals; you can view them here. Just as we do before every major event, we ask our panel of some of the game's top players to rank what they each believe are the top 10 best decks heading into the tournament, and sum up those individual rankings to create the final product. I thought I'd add some additional commentary to the current rankings, since Dallas is going to be the largest Expanded tournament of all time and there are several interesting decks present (and not present) in the rankings. Night March was, once again, by far the most-praised deck by the panel. Of the 13 panel members, only one listed Night March below second place on their personal rankings. (That one player listed it fifth.) All these top-two placements led to 143 total points for Night March, beating out the second-ranked deck by over 40 points. 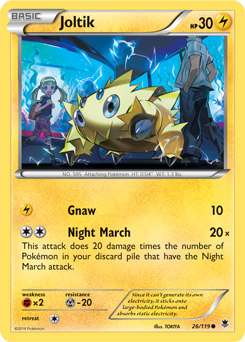 This is interesting because Night March was perceived to be a very powerful force in the metagame that many players would seek to counter in Dallas. 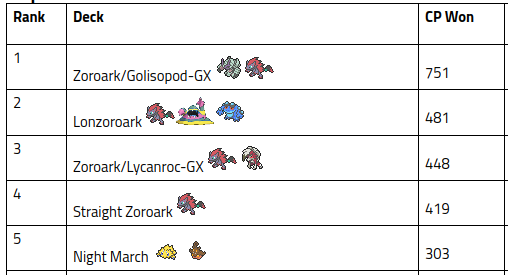 After watching Night March light up the last Expanded event, San Jose Regionals, players began looking at not just teching Karen or Oricorio into their decks, but actually switching to decks with an inherently good Night March matchup, such as Seismitoad-EX/Giratina-EX. (Interestingly, the attributes that make these lock decks good against Night March, at least in theory, also make them good against the other powerhouse of the format, Zoroark-GX, by denying Special Energy.) However, it seems that despite this trend, the experienced players on the panel felt that Night March was still far and away the strongest pick, able to defeat its counters well enough to continue dominating in Dallas. It's still good, sure, but not dominant like it tends to be at Regionals. This supports the idea that the deck requires a very high skill level to play well, which is why we see players like Michael Pramawat and Azul Garcia Griego succeeding with it at Regionals, but less-notable players don't do as well with it. Therefore, here's my advice: expect Night March to once again be a powerful force in the Dallas metagame, but don't necessarily expect to play against it that much if you're going. The deck is deadly in the hands of great players, but its low success at the League Cup level indicates that less-accomplished players will have a tough time beating the deck's many counters. Wailord received a fair amount of love from the panel and despite the high cost of the optimal list (with Tropical Beach), you should expect to see it - and Xurkitree-GX - in Dallas. 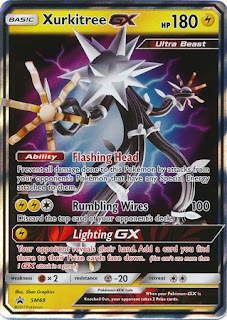 Primal Groudon-EX and Vespiquen were two decks not included in the panel's San Jose deck rankings, but they each took 24 points in the Dallas rankings. Both are perceived to have even to favorable matchups against Night March and Zoroark variants. 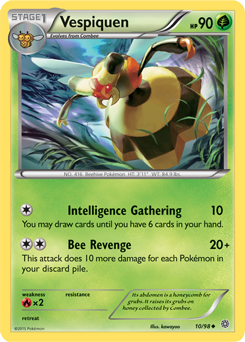 You might want to test against Vespiquen since it is an inherently strong deck and a good Vespiquen player like Rahul Reddy could take down the event with it, but keep in mind that it can be countered in the same ways as Night March (Karen and Oricorio). Primal Groudon is probably the most expensive competitive deck in the game due to needing Tropical Beach, but someone with access to those Beaches may decide to play it, so at least know how to navigate the matchup on the off chance you hit it. The top five decks in these rankings all use Zoroark-GX. The card is incredibly centralizing - we can debate whether that's a good or bad thing, but ultimately Zoroark-GX has had a massive impact on the game. Turbo Darkrai wasn't really present in San Jose but has always been a very strong deck with its sheer consistency and damage output. The Charizard Lounge has a free article up on the latest build of the deck and it wouldn't be surprising to see it do well in Dallas. Stay tuned to PokeStats for full coverage of Dallas Regionals this weekend. We're going to be doing some different things than what we've done before while covering events and it looks like it will be really cool.